Made of a proprietary combination of materials uniquely suited to withstand harsh environments, our clutches are designed to perform and stay cool under the most severe clutch and brake operations. Every unit is individually tested and balanced before leaving the plant. Pneu&dash;Grip&apos;s Q.E.V. can increase cyclical speeds and better mission critical timing, prolonging element and component life. 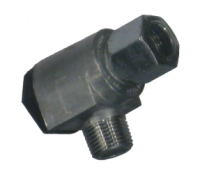 The function of the Pneu&dash;Grip Quick Exhaust Valve is to speed the release of air from a pressurized chamber such as a brake, clutch or other pneumatic device. It is mounted on the device it serves. 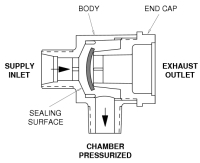 Air pressure enters at the supply inlet and seats the diaphragm to seal the exhaust outlet, allowing the pressurized air to enter the chamber the valve is mounted on. 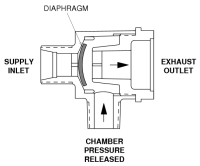 If the air pressure is less than the chamber air pressure, the diaphragm is forced back to seal the inlet while at the same time opening the exhaust outlet causing chambered air to be released into the atmosphere, until the supply pressure is greater then the chamber pressure.